Central Nirvana (earlier a ITC Fortune group hotel) is a 3 Star category hotel located below the Chowrasta Mall and on C R Das Road. From the Mall you will need to walk downhill along a narrow pedestrian way for 5 minutes to reach up to the hotel. From the main gate, there are several flights of stairs leading down to the entrance of the building and the reception area. The building is located quite below the road level. It used to be an old colonial property which was taken over by the Welcome Group and converted into a hotel few years back. There is another gate further down the road from where there is a ramp that leads to the reception door. There is a long narrow manicured garden in front having flowers, seating areas, stone made sculptures and a small show lily pool. I have not seen water in the pool though. The reception counter is small but smart. Being part of the Welcome Group, the hotel has some basic standards. The staff and the waiters are helpful and courteous. The staff at the reception front desk speak good English as well. There are 23 rooms in this hotel. Some are club rooms, suites and the rest are deluxe rooms. Deluxe rooms are the cheapest, club rooms are the mid tier rooms and suit rooms are the most expensive ones. There are some rooms at the reception level and the rest are at the levels below. The hotel is actually built on a ridge from higher to lower levels. There are two floors below the reception level that are known as basements. The lower floors are not buried in the ground. They are built on steps at different levels of the ridge and are all mostly facing the valley at the back side. My favorite is room no. 401 which is a Club Room. Some of the rooms like this one are completely wood paneled with wooden floors and have wonderful slanted ceilings giving a warm and cottage like ambience. However all the club rooms are not similar. In fact the next room 402 is also a club room but does not have such appealing look, although that one too is partially wood finished. The rooms are a bit small and compact. However they are good enough for few nights stay. 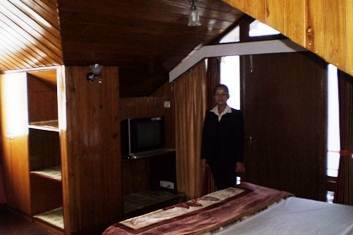 Many of the rooms have excellent view of the Eastern Himalayan range including the snow peaks of Kanchenjung and Tiger Hill. There is a small sitting area with cushioned chairs next to the windows. 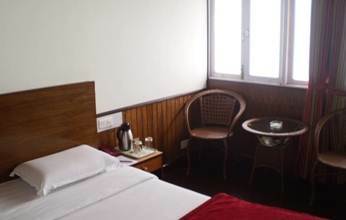 All rooms have TV with cable channels, phones, tea/coffee makers and other standard amenities. The hotel also provides room heaters. Overall the rooms look nice and comfortable. 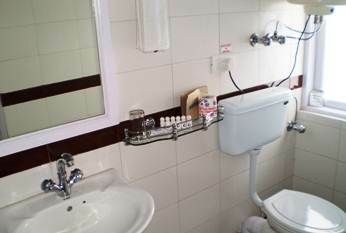 Bathrooms are western style, clean and have large mirrors. There is 24 hours hot water supply in the bathrooms. However the hot water is subject to availability of main power supply. In Darjeeling you should be prepared for frequent power cuts. The hotel has a backup generator which however does not support the geysers in the bathrooms. But you can always ask the waiters to get you buckets of hot water in case of power failures. On the backside of the hotel, there is a wonderful garden from where you can get unabated views of the valley and the mountain range. There is a view point there for enjoying the nature's bounty all around. Most of the rooms actually overlook the garden on the backside. There are chairs and tables laid out in the garden where you can have tea and snacks. 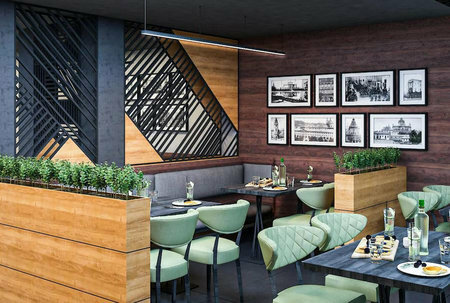 The hotel has an in-house multi cuisine restaurant and a bar for its guests. The tariff supports plans like MAP, AP etc. so that breakfast and meals of your choice can be included in the rates. They essentially prepare Indian and Chinese food. The breakfast menu is quite elaborate and you get several choices. Overall the dishes are tasty and food quality is good. Other amenities include a mini library, Table Tennis, 24-hours room service, travel & transport services, baby sitting services, doctor on call, massage, daily news papers etc. From the reception their is an wooden stairway to a nice attic seating area upstairs that has sofas and tables. Hotel check in and check out time: 12noon. The rooms are nice and comfortable although a bit compact. You get great views from many of the rooms. The service is nice and the waiters are friendly. Dipu is one of the waiters who would always have a smiling face and ready to serve you. Regular rates are on the higher side for its category. The location of the hotel is a little tricky. Some may like it and some may not. If you are looking for a nice cozy 3-star type accommodation in a location which is close to the town center (Mall) but at the same time tucked in a quiet corner, then you will like this hotel. However you need to be prepared to walk for 3-5 minutes from the Mall. It's a downhill walk and walking up to the mall can be a bit tiring. The hotel is in a pedestrian zone and vehicles are not allowed in this part of the town. While checking in or out, if you inform the hotel they will provide porters to carry your luggage. The nearest taxi point is at the base of the Nehru Road (some 10 minutes walk from the hotel). But the reward you get is the quiet and serene environment while being within minutes walk from the town center. The hotel can be a good choice for the families as it has gardens, library, table tennis etc that can keep the kids engaged. About 200 meters below the Chowrasta Mall and on CR Das road. You will need to enter the CR Das road through an approach next to the Mall CCD (Cafe Coffee Day). CR DAs Road, Darjeeling 734101, India. We had booked room in Hotel Central Nirvana which was a very nice hotel. It had a lovely valley view and was located near the Mall. The breakfast at this hotel was excellent which was prepared by their chef Mr. Rajkumar. The staff of this hotel ? Mr. Lama, Mr. Gurung and Ms. Nita were very friendly and helpful. Dear Raj, Thanks a ton for your wonderful review about Darjeeling and Central Nirvana Hotel. We stayed at the club room at Central Nirvana and we had an absolutely awesome experience at the hotel. The hospitality, staffs, property, food and all other amenities are commendable. Really appreciate the way you share the information. Quite crispy and crystal clear to understand. 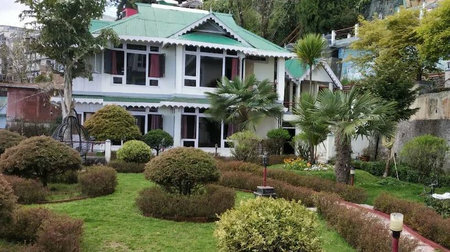 Actually I have booked central nirvana hotel and have booked the toy train ticket on 12th of April,2015 (8 Am to 10 Am from Darjeeling). I need to know that whether I will be able to return after the ride before 12PM (My checkout) time. How far is the station from Hotel or else I have to carry my luggage since morning. Hi, station to your hotel will be about 35-40 minutes uphill walk. Instead take a taxi up to Gorkha Bhavan on Mall road (10 minutes) and then walk (5 minutes).